I've been a long-term user of Evernote and use it for everything from project and task management to storing quotes and ideas. I love the notebook analogy, but like all notebooks it has one major limitation. You can’t spread your notebook out on a desktop and see all of the pages at once. It’s difficulty to get the “big picture” overview of a notebook, so when I want to get really creative with my notes, solve problems, or plan a project, I've always found myself reaching for a stack of coloured, 3x5 index cards and going analogue. Unlike a notebook, index cards are “non-linear”. By storing my thoughts, ideas and notes on index cards I can lay them out on a desktop and get a clearer big picture overview of a topic. With this big picture it becomes easier to see patterns and connections between notes. I can group related notes together spatially or by colour and I can prioritise them. I’ve found nothing that gives me that same sense of organisation. In the past I’ve combined index cards with Evernote by taking a snapshot of my finished layout and then scanning the individual cards back into Evernote. In an attempt to digitise the above process, I've spent my spare time over the last year developing a web application I call CardDesk. CardDesk is simply my attempt to wed my love of Evernote with the highly visual, non-linear and creative benefits of index cards. Using the index card analogy, CardDesk allows you to access you Evernote notes and arrange them as “Cards” on one or more “Desktops”. Cards can be moved, resized, stacked and colour-coded. Cards can contain images and links to documents and web pages. They can also be edited using Evernote’s web interface. CardDesk is still in very early beta at the moment, but I've already used it to manage projects, create vision-boards, research products and capture and prioritise software requirements. It also works particularly well when used with the Evernote web clipper. I've been working on CardDesk in isolation and thought it about time I took some direction from the Evernote community. If any of the forum members have the time and interest I would greatly appreciate their feedback. If you experience any issues or would like to give feedback please email me at ashley.rawbone@carddesk.net and I'll respond as quickly as possible. I have tried CardDesk, and first thing I realized, is that it does not read my Business Folders. I have a magazine project running right now, and I immediately got hooked on your idea. the card desk is something I have wished for for some time. However, I have all the material I would want to want to display in one of my Business Folders. A vision board for my upcoming articles would be a huge leap forward. Do you think, you could add Business folders? The second thing that caught my immediate attention was, that i do not have the option to sync manually. I have added several notes on the desk but could not find a way to delete them from the folders. It is nice, that I can delete from the desk but then the note is still in the folder. I have to go back to my EN client and delete the notes there. This is very inconvenient. So instead of using the developer option which allows your web app to read only, I would prefer you wrote it to read and write for full access to adding and deleting notes from the EN notebooks. add – ability to add and delete notes from the folders. ask – Evernote to integrate card desk into their UI !!! Thanks for the feedback, it's much appreciated. I'll certainly take on board your suggestions for the next release. Business Folders are are new to me, so I'll get up to speed on them and see what's involved in supporting them. How hard can it be? Did you discover that clicking on the "elephant" icon on the card or double clicking on a note in a notebook will open it directly in Evernote's web client? This makes deleting and editing a little easier. Well, you pulled off a huge new thing, so from there it should not be too hard. I am already spreading the word here in the forums. Concerning the Business folders, you should contact Jeff he is an Evernote Evangelist who might just know the person to talk to regarding this topic. Interesting concept, and I realize it is an early stage beta, but I always shy away from landing pages that have little to no information on the program. I'd feel more comfortable if there was a video and a FAQ section, along with some assurances on security of my Evernote data. I couldn't agree more. I feel very much the same. A full featured website is high on my list of priorities after I have completed the initial feature set. In the meantime a quick note on data. Any Evernote data that is stored locally to the application is stored on Microsoft Windows Azure Cloud servers that comply with key industry standards for security. Also, only those notes that are currently sitting on a Desktop will be stored on the server for performance reasons. Remove a Card from the Desktop and the application will with have no record of the Evernote note. Way back in the dawn of computing time, there was a memory resident DOS program called Sidekick. You accessed Sidekick by hitting the Alt key and a window would pop up (pretty revolutionary in DOS days) with a menu of notes that you could easily edit. I used to do all my contact notes in Sidekick. Then Windows was released and character based programs would no longer work. Eventually, Sidekick developer's Borland released a windows version called Tornado Notes which did, from what I remember, something similar to your application without the ability to easily rearrange them on the display. Carddesk looks very interesting, but I have a question: Is my beta account password the same as my Evernote password? Hi Rgrenader - No, you are free to choose any username and password when you sign up for CardDesk. You will then be prompted to authorise CardDesk to work with your Evernote account. CardDesk has no knowledge of your Evernote account password. I rarely visit the forums here, but I'm so happy I stumbled upon your post. I was an user if Springpad and loved because it had this kind of visual presentation. 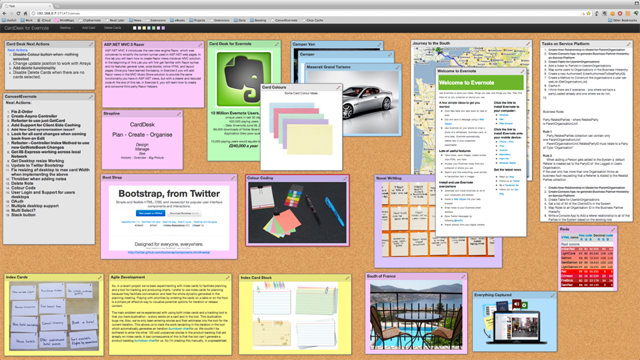 I eventually switched to Evernote for its power and sophisticated note management tools, but miss the visual "idea board" features of Springpad that are really a necessity for many of my projects. I've created my own rudimentary versions of this within Evernote, but nothing fluid or convenient. I love where you are going with this and I really hope it is embraced by Evernote. Thanks bttrflygrl - I appreciate the feedback. Please do let me know if you have any feature requests that would help with your project "idea boards". I'm currently working on bringing in business notebooks after which I'll be adding adding tag support. I'm also toying with the idea of "shared" Desktops. Any user viewing and updating a shared desktop would be able to see changes made by other users in real-time. This would allow groups of people to work collaboratively on an idea or project. I created a CardDeks account and tried to use it but I don't know how. No notes from Evernote show up and when I create a new card it is empty and I cannot enter anything. If I click on the elefant on the card Evernote web opens and creates a new note. If I put something into that note it doesn't show up in the new card. Did you move your cursor over to the left hand side of the screen? A panel should slide out revealing your Evernote notebooks and notes. Create new desktops using the Desktops menu. Move the cursor to the left of the screen to reveal your Evernote notes and notebooks. Drag notes from your notebooks onto the Desktop to create cards. Select multiple cards by clicking and dragging on the Desktop background. Click on the "elephant" icon at the top of each card to edit your note. Double click on any note in your notebooks to view it. Colour, stack and arrange your cards using the icons at the top of the screen. Let me know if you are still experiencing issues. Hi - clearly I missed any memos on this, because I just fell over it while looking to post something of my own. Initially I had the same problem as Stuhrer - the 'permissions' I allowed in Evernote included adding and deleting notes, so I assumed I could use this desktop to create a new note - which is kind've nice when you're just starting a new project - you at least need a list of things you're going to do.. However while I could set up a new card, it refused to allow me to edit it - until I worked out how to start a new note and drag that onto the desktop. Full marks however for a really smooth visual display of note contents and a brilliant extension of the Evernote database that allows better data manipulation. I've always wanted to get rid of all paperwork, but putting it all online has the inherent "out of sight, out of mind" problem that I could easily forget some important bits altogether. I favour mind-maps as one organisation tool, but this looks like a more flexible - and most importantly integrated - approach. Please keep us up to date on your progress! Have you thought about adding a sharing feature to your desktops? This is a much more accessible way to look at information that would appeal (imo) to educators and others..
Hi Gazumped - Thanks for the feedback. It does appear that a few users are having trouble editing notes once they have been added to the desktop. Just to be clear, note editing takes place in the Evernote web client. Could you tell me if clicking on the elephant icon at the top of each card opens the note correctly in a new Evernote browser window? Any changes made to the note should be "instantly" reflected on the card in CardDesk. Double clicking on a note in the side-panel should also open the note in Evernote. I am very keen to introduce shared desktops with real-time updates. Any user viewing and updating a shared desktop would be able to see the changes made by other users as they are made (including layout changes). This would allow groups of people to work collaboratively on an idea or project. Yep - I got that clicking on the icon opens a browser to Evernote web, and changes have to be made in the browser, not on the desktop. It's a shame though to have this limitation - if I could create new notes quickly on the desktop I could 'mindmap' (without the connections) an idea, laying it out visually - and then collate / edit / summarise the content into one or more permanent notes. The sharing idea I agree is a major plus - allocating a notebook to someone unfamiliar with Evernote just adds the Evernote learning curve on top of the notebook content. Sending a link to the desktop allows you to lay out the information in the order and style you need it to appear - and it's way more attractive and less intimidating than a green notebook screen.. Unfortunately, changes made in the Evernote Desktop Client will not show up in CardDesk until the Desktop Client syncs with the Evernote servers. This happens at a regular interval configured in Evernote’s sync settings. However, you can manually initiate a sync with the servers at any time from within the Desktop Client. This will push any changes you have made into CardDesk. I have tried to avoid creating an Evernote note editor due to time constraints, but I have considered adding a “Quick Note” feature. This would allow you to specify a title and some plain note text when creating a new note directly on a desktop. Would this satisfy your 'mindmap' requirement do you think? Plain text would be great, and is definitely all I need! Thank you for the hint. The mouse gesture is a bit unusual for a web application but once you know it works. I still have the problem that in a note I create via the menu and edit in Evernote by clicking on the elephant icon, the title remains "New Note" and the body remains empty. I'll try some more and let you know my results. Hi Stuhrer - I've just taken a look at the CardDesk logs for today and it appears I have a bug. The "real-time" updates that I've been boasting about are only working on my account! I'll be working on a fix this evening and should have something in place later tonight. This does explain a lot of the feedback I've been getting. Sorry for the inconvenience. No problem. I am not going to do further tests during the weekend. And what about your weekend? Take it easy! The fix is in place. Changes made in the Web Evernote Client should now be reflected in real-time in CardDesk. I've always considered this one of CardDesk's coolest features. It's a shame it hasn't been working for the newly signed up users! One of my favourite demonstrations is to open CardDesk on my PC and place an Evernote note on a desktop. I then mark-up that same note using Skitch on my mobile phone, and hit the save button. When everything is working correctly the card in CardDesk updates in seconds. Thanks Stuhr for spotting this one. I think you have something here. Keep up the good work refining it. I'm glad I found this one. I hope a tag viewer is on the way. Only had a chance to briefly look at this before I left work but looks like this could be something I'll use every day. I work in a school and constantly trying to convince teachers to work with evernote, this could be big! Fantastic work - will report back once I've had more of a tinker. You are right. I appear to have introduced a bug with the z-order in the last update. I'll get fix out ASAP. I'm really enjoying using the application. It's a great idea that is incredibly helpful. I'm very busy at this time, but as I use it I'm noting things that come up and I'll email you my feedback. When you update, will we be notified from within the application that the update is available? I'm assume so but I thought I'd ask just in case there's some other way to update that I should keep my eye out for. Thanks for your fantastic work! I'll be releasing an update later today, which will include, the much requested support for Tags. Thanks for your response. I look forward to the update! A really great idea. I'm a big fan of Personal Kanban and have been thrashing around trying to implement it with Evernote. First I tried various "noticeboard" web apps which were OK but didn't integrate very well with Evernote and other tools I use. I then tried using Evernote itself... not really a good fit. I then found Trello which is great. I exported ideas, projects and actions to Trello from Evernote using Zapier. At the beginning of this year I decided it was easier just to do everything task/project related in Trello. Your tool seems to give the best of both words. One suggestion: it would be useful to add a yellow sticky, or title under which you can put a column of notes. I guess you could do this with a "special" evernote note. I started using CardDesk today -- it's exactly what I was looking for with Evernote. I wanted a corkboard style way to display notes in a notebook, and CardDesk does that. I can now see all my notes in a particular notebook (or just the notes I want) in a single eye-view. I'm especially happy that I can make my CardDesk board my browser's home page. When I open Chrome, my default notebook's notes appear right in front of me. Thanks for the recent updates...much appreciated! The remembered and restored desktop zoom levels are fantastic. It's great that the update log is on the sign-in page, as it should be for obvious reasons - two of which is that is gives potential users who land on the page a snapshot of the development progress of the app, and it immediately lets them know that the developer is currently and pro-actively improving it. 1. However it would be great if within the app, you include an "About CardDesk" drop down menu that displays the version that is in use, and within the drop down menu a choice to display a pop up of the application's update log - which covers the full history, or at least 3-4 versions back. There are often times while I'm using an app that I want to quick-reference and review the features of the current and proceeding versions, and the progress of their update details, without having to venture – if possible – too far from my work flow. 2. Also from within the app, include a pop up display notification that alerts the user when the app has just been updated and the details of that update. Generally I love to get app updates and if possible I always want to know about them when they occur. It would be nice to learn about updates to CardDesk, without the necessity of going to the sign-in page to learn their details and new features. I was logged out for a couple of days and upon signing in I happened to notice the 1/7 and 1/8 updates. Normally I keep the app open and active in my browser while staying signed for as long as possible because I'm continually working with it. Since I don't need to repeatedly log of and sign-in again I don't, but as a result I don't know about updates unless I deliberately log out and view the sigh-in page. These clearly aren't necessary additions, but they are minor finishing touches of convenience and luxury that may help users have a more settled-in experience while using the app. I do apologise for the late response - I've only just seen this post. Thanks again for the feedback. You've got some excellent ideas which I will definitely take on board. Due to real-life time constraints over the last couple of weeks, I haven't had much time to update CardDesk, but hopefully that will change over the next couple of months. Thanks for your response. No need to apologize...life happens. I appreciate that you are open to feedback and look forward to updates whenever they happen. Take care of yourself and be well. a customers problem, this fits the bill perfectly. better), using your interface would be much much more friendly. In any case its great at the moment and can only get better, I think you've got a little gold mine here. Again, sorry for the late response. For some reason I've not been getting email notifications when people post to this topic. Thanks for the feedback, it's much appreciated. A lot of people have been asking for an iPad version so it is definitely on the to-do list. I do plan to support Evernote business accounts, but I haven't considered how I might support multiple basic accounts. I will certainly give that some thought! Wow this was exactly what I was looking for to help me write my research papers! Keep up the good work. This is an amazing tool for Evernote. So glad I found this discussion. One or two notes seem to crash and not open on the desktop (not sure why) but otherwise this is pure simplicity and lets me see lots of notes at a glance while I work on a project. Loving Evernote even more...love this tool too!! Great app idea! It allows users to do some basic mind mapping with their EN data. This looks most intetesting and have signed up for the Beta version. Give me a few weeks to play around with it and I'll return with some feedback. you did a great job! This is a much. much better interface than evernote web (I'm a linux user) and really slick. It is very, very usable just as it is. It would be useful if cards ON the current desk were highlighted in the left hand pane search. A follow on would be a context menu from the search to "add missing cards to the desktop" . This would give a very quick way of keeping a notebook and desktop in step (which is how I organise my todo lists). The follow on to that would be a desktop option to "remove extra cards" which takes everything not in the current search off the current desktop. Signed up a while back and forgot about it - Sorry. Started using yesterday when I got frustrated trying to view a group of notes. Very helpful to see the whole group. Thanks. Seems like it would be nice to have a way for a desktop to show all notes with a certain tag. Then I could easily tag all notes I wanted to see on a certain desktop. But like i said i am really just now really using this. 1. Can you open this on any web browser? 2. Does it only work on laptops, I mean can it be put on a tablet or phone? 3. I also saw that someone made it their homepage. I'm not the greatest computer person so can someone please tell me how to do that. It would be a great thing to have that be the first thing you see when you go to work . . . all of your notes and reminders in one place. So cool. Thank you for listening and I can't wait to hear from someone. 1) As far as I'm aware CardDesk works well on most modern browsers with the exception of Firefox. 2) Unfortunately CardDesk it is not yet "touch ready" and does not work well on Tablets or Phones at this point. I look forward to hearing any feedback you may have once you start using CardDesk. Carddesk is awesome! I have been looking for something like this for a long time. I specifically wanted something with a card view of EN notes that could be used on a Smartboard digital whiteboard. Apart from some touch-related features, Carddesk works great on a big touchscreen. Touching notes to move them around, group/stack them, and change colors is incredible. Clicking the EN icon to edit a note in EN Web is great. The main touch based feature I could use right now is the ability to resize by grabbing a corner, side, or bottom. Keep up the great work! * does CardDesk only work for synched notes or also for local non-synched notes? * Firefox is 1 of the major browsers out there, so how come CD does not work for Firefox? Any plans to add FF compatability? @AshleyR As a matter of interest what's the issue with Firefox? * I am using Firefox & it works so far. Please, keep moving it foward... this is AMAZING! For my needs this is a lifesaver - i was even looking for alternatives to evernote to handle a project (the brainstorming side of it) since i needed to correlate notes (and was craving to do it visualy). I would love to see some mind-mapping features in this (theres lots of potential for that), but i know such features aren't a priority right now nor should they be, but keep that in mind for later on- that alone could make carddesk the best evernote companion, its a long wished feature. I guess linking notes (a line or arrow between then) may be easier to add, but more then enougth for most needs. -'Title': text boxes of a different type-face and bigger font size with limited characters, stored along each desk(that is, not stored on evernote). They could be used to describe something around a bunch of cards or, more obvious, as 'titles' for diferent groups of cards on the same desk. No need for anything else, users can separate groups laying out as it is, only thing ive missed was that. -Fold/unfold cards: minimizing a card to its title only(remaining only the bar on top of each card) and back to the previous card size. -Shortcuts: placed as icons anywhere on the desk, leading to another desk; Or grouping desks(creating sub-desks perhaps)- any sort of correlation between closely related desks. I really like how this works with Evernote. I've always wanted a better interface for working with the notes. Not a lot of discussion recently. Is CardDesk still being actively developed? I don't want to get to into something that is not going to be around. What's up? How are you? I probably speak for a lot users in inquiring about your well-being, if CardDesk still holds your developer interest and will you continue to support it. I also use CardDesk for my upcoming e-commerce site, visualising the project and demonstrating the business idea for colleagues and partners. I sort of planned out this app in my head as I felt it was needed .. It is like you read my mind. use visual dragging to move notes to notebooks tabs. Ashley does not respond anymore, 47getgoing asked him on 7th January how he is, and so far no answer. Is he still around? Is he still working on this project? What is going on ??? I haven't visited this forum for a quite a while and I'm very sorry I haven't replied to the above posts - I started a new "real-life" job about a year ago and it's been exhausting. I'd just like to say that CardDesk is still a project very close to my heart and I have every intention of supporting and maintaining the site for the foreseeable future. I think I have taken CardDesk about as far as I can on my own as a "spare-time" project. I would love to take CardDesk to the next level and be able devote myself full-time to it. I'm constantly on the look out for a way to make that happen so any suggestions would be greatly appreciated! Thank you again for trying CardDesk and for all of your positive feedback. Ashley, congratulations on the new job. I must say I have the strong impression that CD is now a sideshow for you & will remain so, eventually dying a quiet death. Your prolonged absence from this forum, and only posting on prodding backs up that impression. Perhaps I am wrong, I would like to be, but that is my impression. You have no way of changing the password on CardDesk, thus am removing. If installing quicktime fixes the problem, great for others. But, for now, I wont use it. Please explain your post a bit more. What was the problem you ran into? 1) how do I log on? 2) how do i print out cards? I haven't visited this forum for a quite a while and I'm very sorry I haven't replied to the above posts - I started a new "real-life" job about a year ago and it's been exhausting. I'd just like to say that CardDesk is still a project very close to my heart and I have every intention of supporting and maintaining the site for the foreseeable future. 1. Just put everything you have on github and find people like me to make it better and donate for the hosting costs. 2. Make your own business out of it. Which is really hard with no time and in general with web services. 3. Find a way to make Evernote add CardDesk to Evernote! I just discovered CardDesk today. Great app! I used to use a combination of corkboard apps and Evernote to keep track of storylines for some projects I'm working on. But it was too cumbersome to keep them in multiple apps. This could be a great solution. Just a couple suggestions (It sounds like you aren't developing actively at the moment). If you can't edit the card without being in the Evernote interface, then clicking an dragging the card should work everywhere on the card, not just on the title bar. Thanks and I hope you keep this App going! Sorry doesnt work for me. Request Third Party App developers to remember that millions of EN users work offline, most oft the time. Building 'Web' only solutions TPI doesnt work for them. CARD DESK BETRAYS USER TRUST? One of the greatest amount of skepticism involved in giving Evernote access to Third party keys, is how the data is going to be handled. Typically, if the client is built on the device, there won't be any problem. But, I think my skepticism in giving third party keys access to Evernote account has been proved true. As you can see above, i authorised Card Desk on January ( See above post), and i clearly said that it wasn't working for me. Since then i have not used the Card Desk service. From my Evernote access logs, I find that Card Desk has accessed my account yesterday 4/4/16. I am shocked to see this. I am totally losing my trust. I have since then revoked my access to card desk, and i going to do so for any other web service that accesses my Evernote data. I can understand your concern, but let me assure you that your account has not been compromised in any way. CardDesk gets notifications from Evernote whenever there is a change made to a note in your Evernote Account. When CardDesk gets a notification, it checks to see if the note in question has been used on a CardDesk desktop. If it has, then CardDesk is "interested" in the note and therefore "pre-fetches" and caches it locally on the CardDesk servers ready for your next visit to the Desktop (It also fetches and re-sizes any images found in the note). This is a performance optimisation that greatly improves the user experience of CardDesk. Please email me at Ashley.Rawbone@me.com if you would like me to explain further. I'm sorry to have caused you alarm. Thanks for your response. I am happy that your being open about how the service works, but i'd like not to have any more of my data stored on external servers. Since i have revoked my access, I wish to remove my data from Card Desk servers. I'd like to know how. Please let me know. Unfortunately, deleting accounts is a manual process at the moment. If you could email me your CardDesk user name (from the email account you signed up with for security purposes) I will delete your account and all it's associated data this evening. Alternatively, for your own peace of mind, you could remove any Cards you have on a Desktop. This would automatically delete the corresponding Evernote note from the CardDesk servers. In response to Panzerkampfwagen, "Request Third Party App developers to remember that millions of EN users work offline" - I'm not sure why Third Party App developers, when making a web app for web clients (such as for those of us on Chromebooks), should need to keep offline users in mind. Why, when there are so many offline app developers who don't keep online users in mind? I do get your viewpoint that many Third party developers need to build products for Chromebooks as well. Point Taken. But this is not an either-or., Millions of people like us live in very poor Internet Infra locations, and that is the trouble here. I only requested that Online Developers add the Offline Option. I love the idea of Card Desk. It's a little clunky for keyboard jockys but I'm getting used to it. One little thing that puzzles me: As I write notes I often add check boxes so my tasks will appear in my search and also in Taskclone. Whenever I add a checkbox, Evernote refreshes itself ("adding new information") and then duplicates the card. When I looked at the side board, I now have six duplicate notes. What am I missing? TL;DR version: I have found an incredible replacement for CardDesk. It's called Milanote. It is in beta and it is spectacular! It has been sad to see CardDesk with all its promise, lose steam. Entirely understandable on Ashley's part as he has a life to live and I imagine, as most of us, bills to pay. CardDesk was a great concept and it is a shame that Evernote did not pick up on it and somehow integrate it or replicate it and introduce the functionaility into the main Evernote program. In my nine years of using Evernote, I have always used secondary tools (LiveMinutes, OneNote, Springpad, Moleskin, dry erase boards, post-its, and kanban, more recently, IQTELL, Trello, GDTNext and Paper) to try and get things done. Being a very visual creator, Evernote has served well as a backdrop or collection tool, but it has never matched the way my mind works. I love Evernote for what it is and I can't imagine ever leaving it behind, but I will always be searching for a more visual and flexible tool. For those of you in the same boat, I strongly recommend that you sign up for the Milanote beta. I have been blown away with this tool! It looks like it will have a free version and a paid version. The paid will be higher priced than Evernote, but if the developers follow through on their roadmap, it may well be worth every penny. My dream is that Evernote and Milanote could somehow coexist/integrate as this would provide two incredible tools with very different interfaces and experiences.